Courtesy photo Scout Joe Gavlek, far right, is shown with Michigan Gov. Gretchen Whitmer, center, and other scouts. 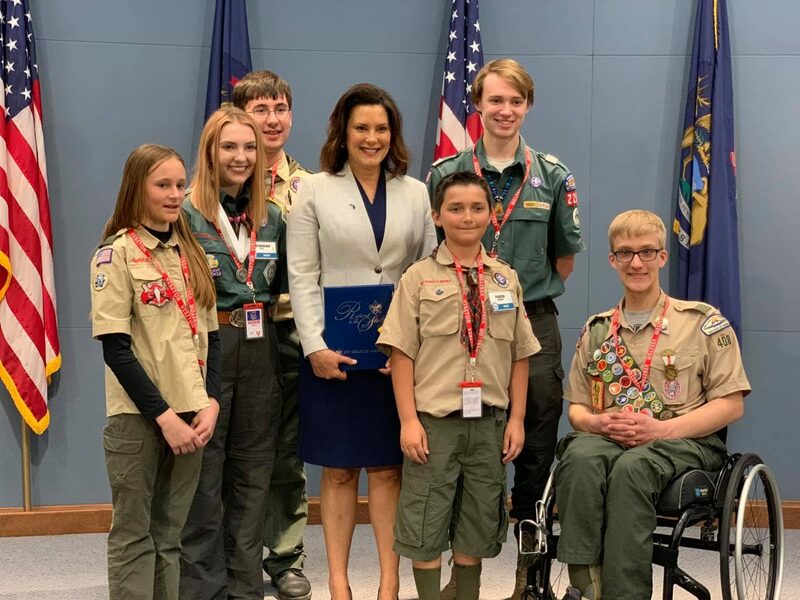 ESCANABA — Governor Gretchen Whitmer met with youth members of the Boy Scouts of America on Wednesday to highlight the impact of scouting in Michigan. This impact is shown though the personal development, leadership training and community service of the 68,000 scouts in Michigan. The contingent of 23 Cub Scouts, Scouts, and Explorers included Eagle Scout Joe Gavlek of Troop 408 in Escanaba, sponsored by Bethany Lutheran Church. Gavlek is 17-years-old and is one of the older members of his troop. As an older scout, he is an active leader to the less experienced scouts. His scouting career is one that any youth would be of envious. He participated in the Iron Scout Challenge at Camp Hiawatha, a two-mile canoe, 12-mile bike and five-mile hike. He has also participated in countless weekend troop events. The highlight of his scouting was his Eagle Scout project. Gavlek increased the accessibility of Gladstone beach by fundraising and installing beach mats. Beach mats give access to people with wheelchairs, walkers and families with strollers or carts. This summer, Gavlek will participate in the week-long Governor’s Honor Guard on Mackinac Island.